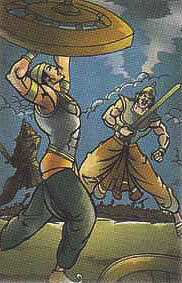 During the battle, Drona had been ordered to capture Yudhisthira alive, so Arjuna always protected him. Once Arjuna had gone after the Kaurava warriors and Yudhisthira with his soldiers unprotected. Drona approached Yudhisthira with his soldieres arranged in the circular formation known as chakravyuh. Arjun's son, Abhimanyu, had learnt from his father how to enter the chakravyuh but did not know how to come out of it. Only Arjuna knew how to break the Chakravyuh. But abhimanyu decided to enter the formation. Jaidhratha, the king of Sindhudesha, had obtained a boon from Shiva that he would be able to stop the Pandavas for one day. He stopped them from entering the chakravyuh to help Abhimanyu. Six warriors including Drona, Duryodhana, and Karna together attacked Abhimanyu. He lost all his weapons. Finally, the Kaurava warriors broke the code of war; they attacked the unnamed Abhimanyu and killed him.